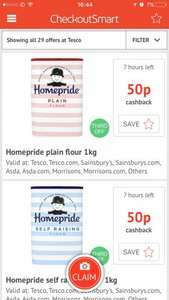 Homepride 1kg self raising and plain flour [tin packaging] on offer for £1 at Tesco and also 50p cash back via checkoutsmart, making them 50p each after cash back. Redeemable up to three times each. Thanks, I'll get some for my lovely wife. I'm sure I heard her say that I never buy her flours anymore! is there much difference between these flours and the 45p for 1.5kg in almost all the other supermarkets if u use for making samosas pizzas nan bread etc. is there much difference between these flours and the 45p for 1.5kg in … is there much difference between these flours and the 45p for 1.5kg in almost all the other supermarkets if u use for making samosas pizzas nan bread etc. Not really. The branded flours claim to be finer grains but in years of baking, I've never noticed it. The key difference between flours is the protein content (look at the nutritional information). Bread and other yeasted doughs such as pizza dough need a 'strong' flour - meaning a higher protein content. Strong flours also absorb more liquid when you're using them. Cakes and pastry work better with 'soft' flour - low protein content. According to their website, Sainsbury's basic plain flour, their standard one and Homepride all have 9.7% protein. Not really. The branded flours claim to be finer grains but in years of … Not really. The branded flours claim to be finer grains but in years of baking, I've never noticed it. The key difference between flours is the protein content (look at the nutritional information). Bread and other yeasted doughs such as pizza dough need a 'strong' flour - meaning a higher protein content. Strong flours also absorb more liquid when you're using them. Cakes and pastry work better with 'soft' flour - low protein content.According to their website, Sainsbury's basic plain flour, their standard one and Homepride all have 9.7% protein. ​the Lidl ones and I think aldi the 45p bags are 9.4g and asda is 10.1g per 100 protein but that still makes better pizzas and nan breads etc in my opinion than asda why is that the reason.